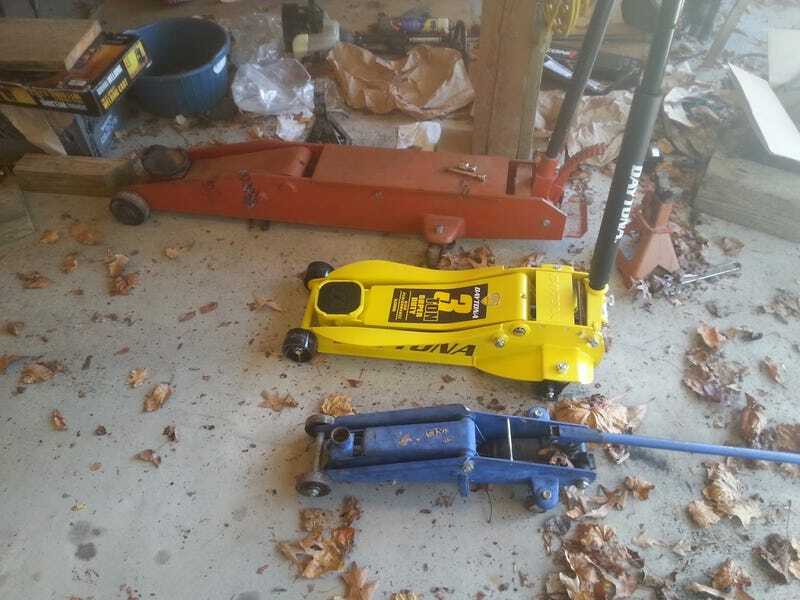 Have you ever wondered what it's like to live with a 5-ton floor jack? Well first off it’s quite large, at 57" front to back and a height of 53.5" it takes up quite a bit of real estate. Now while you can lift up the front and swivel it around on the rear casters it can still be a bear while working in a confined area. But let me tell you once you start using it you’ll forget all about the 30 minutes you spent navigating it to the front of your car. This thing is the most impressive piece of vehicle lifting technology i have seen. Not only can it lift up your work truck, but it can do it with your track car in the bed AND your mother in the front. Plus do you see that magnificent angled piece of metal on the back. That’s a foot pedal! It turns even the heaviest of vehicles into an effortless flight of stairs, and your hands are free for other jacking related actives. Now you’re probably wondering just how much this concoction of metal and hydraulic oil costs. Well, it’s not cheap. While the one in my garage was free, you people probably won’t get that type of deal and you’ll have to shell out $560 for this particular model, but you’ll get free shipping, which I think is a bit cruel, because this thing weighs 249LBS and I feel like anybody who has to handle this thing should at least get reimbursed something. Even if it is $2 and a few Black&Milds for your local UPS driver. So yes this is the most amazing jack I have ever owned and everyone on oppo should go out and buy one.